From a handful of worshippers to a membership that now comprises the largest Jewish Congregation in West Virginia , from a private residence, converted to religious use, to the present handsome commodious structure located at the corner of Virginia and Elizabeth Streets is the story of the B’nai Jacob Synagogue of Charleston , West Virginia, now commemorating its 75th anniversary. The B’nai Jacob Synagogue was formally established in 1897 or maybe as early as 1894 when the following charter members-Abraham Frankel, Abraham Boiarsky, Fishel Boiarsky, Sol Cohen, Wolf Beckenstein, Jacob Gluck, Isaac Pimpstein, Louis Frank, Julius Nearman, Israel Cohen, A.P. Silverstein, Louis Ruffner, Isaac Padlifsky, Solomon Hark, Max Slotnick, Jacob Polen, and Ben Melman organized to form a congregation for worship in accordance with Jewish traditional practice. For the preceding ten years occasional services were held, at first in private homes and later in a rented hall on Kanawha and Summers Street, by the few orthodox Jews who had migrated to Charleston from Eastern European communities. The first Cantor and teacher of Hebrew employed by the congregation was the Rev. Samuel Friedman who served from 1895 to 1930. By 1908 the congregation, numbering some sixty odd members, had outgrown its limited quarters on Washington and Court Streets. In that year it purchased the vacated State Street Methodist Church on State and Court Streets. This new facility provided for expanded religious, educational and social activities. It served the congregation for the next forty-two years, when the congregation grew to some four hundred members. The first ordained Rabbi of the congregation was Nachman Heller who served from 1904 to 1912. He was succeeded in turn by Rabbi Leon Spitz, M. Kasplander, Sol Weinreb, Jack Friedman, followed by Rabbi Samuel Cooper, who passed away January 2, 2006, from 1932 to 1981. Rabbi Cooper was succeeded by Rabbi Chaim Landau who served from 1981-1986, followed by our present Rabbi, Victor Urecki who took over the pulpit in 1986. Other religious functionaries who served the Congregation over the years were Rebbe Philip Cohen, I.J. Rubin, Rev. N. Silverman, Rev. Alter Freedman, Kalman Shore , who served from 1919 until his death in 1954, Cantors Oschry, David Wolfe and the late Paul Reiss who held his post from 1949 until his death in 1968. Rabbi Cooper was assisted by Rev. 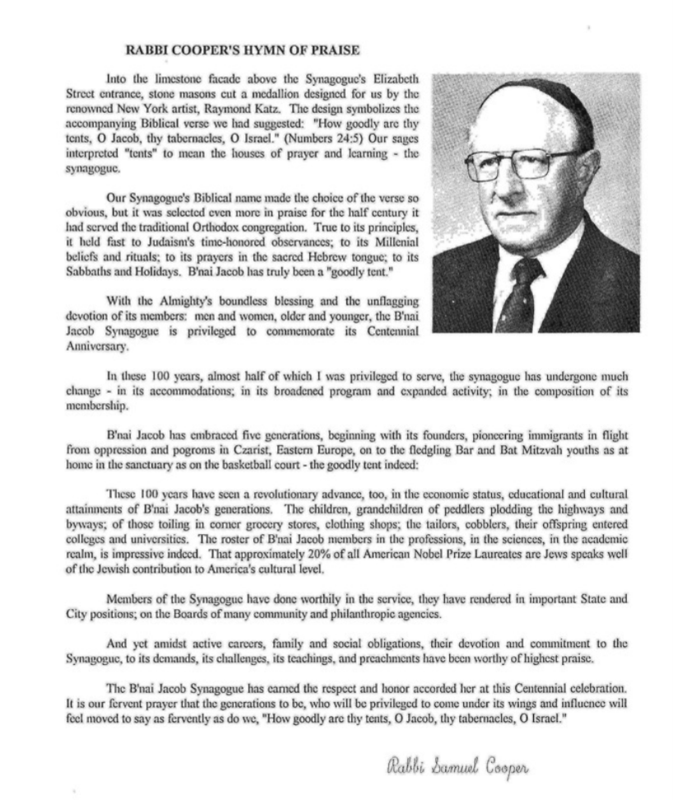 Benjamin Samuels, who had been with the Congregation since 1941 and who continued his position with Rabbi Landau, and Rabbi Urecki until he passed away July 3, 1989. In the early 1930’s, the pioneers of the Congregation turned the reins of leadership over to a new generation of younger leaders. Co-indidentally with their assumption of the lay responsibilities, Rabbi Samuel Cooper, who had just been ordained by the Theological Seminary of the Yeshiva University of New York, was called to assume the religious post. Under new leadership, the Congregation, even amidst the severe economic depression of the time, succeeded in paying off its building debt, and renovating and enlarging its building. The Synagogue program gained even wider scope – a Sunday School with an organized curriculum, under Jack Katzeff, its long time superintendent; late Friday Night Services; a library of Judaica; a Dramatic Society that presented plays and musicals in Yiddish; services whose decorum and congregational singing gave new appeal to the time-honored orthodox tradition. The thirties, tragically, saw the rise of Hitler and his oppression of the Jews of Germany. The members of the Synagogue manifested their great concern for their oppressed brethren and joined in creating the Charleston Federated Jewish Charities to raise the huge sums required for their fellow-Jews in flight and in need. This fund continues to this day with a massive program of aid to Jews in Israel , in other lands and to a multitude of charitable educational agencies in the United States. In those years the Synagogue members were the mainstay of the Zionist Organization to help open the doors of Palestine to the refugee Jews and to work for the ultimate establishment of a Jewish State in their ancestral land. The comprehensive program of the Synagogue also encompassed the care of transients. Through the generosity of Isaac Padlibsky, an “Hachnosus Orchim” –House for the lodging and feeding of strangers was provided and which the Synagogue administered. The busy Synagogue activities of the thirties were but the prelude to the decades that followed. On Yom Kippur of 1943 Rabbi Cooper launched the appeal for funds for a new Synagogue which resulted in a total of $165,000.00 in pledges, the largest sum ever raised in the Charleston Jewish Community. When building plans became more ambitious, an additional $110,000.00 was raised at a second appeal several years later. The decade of the forties included the war years. One hundred and fifty young men and women of the Congregation were in the military, and two of whom, Lt. Sam Kanner and Jack Herman made the supreme sacrifice. The improvements in the Synagogue operations went apace and for the first time a specially trained cantor-teacher was employed. In June 1941 Rev. Benjamin Samuels came to Charleston as schochet-mohel-teacher. It was a continuing responsibility of Rev. Samuels to perform several religious functions and to have taught many boys for their Bar Mitzvahs. In 1948-1949 B’nai Jacob’s modern Synagogue (with Spanish-Portuguese side seating in the sanctuary) a school, social center and gymnasium was erected. The first services were held on Rosh Hashanah of the latter year (5710 Anno Judaica) with the pews having been installed at the last possible minute. To have seen the whole sanctuary full, with the wide center processional area and the bima in the middle, was to have seen a lovely sight. The new building made possible expanded programming – a Jewish Community Center that sponsored a wide variety of social, educational and recreational activities; a Men’s Club for the fellowship of monthly dinner-meetings, cultural programs and to direct an athletic program as well as render other services to the Congregation. The new faculties brought about a number of changes. Weddings that heretofore in Charleston (and elsewhere too) were mostly held in hotel ballrooms, were brought back to the Synagogue. The great processional aisle with its general beauty gave the Synagogue weddings a setting beyond compare. Permanent possession of pews by those who had purchased them in the old synagogue was not possible in the new. Religious honors on the High Holidays were assigned by a committee to the membership on a rotating basis and the practice of auctioning was discontinued. The wide 15 foot aisle made possible a Kol Nidre Torah procession that is most stirring and impressive. A daily nursery and kindergarten were instituted. B’nai Jacob was fortunate to inaugurate its new building with a fine new Cantor– Paul Reiss. He came here with his family for the High Holidays of 1949 and made his presence felt in teaching, in cantoral work, choir direction, and in helping organize the Charleston Church Recreation Association with its athletic program in which the B’nai Jacob Synagogue was a major participant. He took over much of the office work and gave, unstintedly, of his talents. His sudden death on January 31, 1968 left a vacancy in the Congregation that has yet to be filled. He served B’nai Jacob and Charleston well. The decade of the sixties brought other improvements. A beautiful daily chapel, the gift of Messrs. Charles and Robert Levine in memory of Violet Levine, was installed in a remodeled room on the main floor; the daily Minyan was strengthened and is being maintained; the synagogue was air-conditioned and the adjoining property was acquired and converted for parking use. It should not be forgotten that a Synagogue must provide for the respectful and traditional care of the dead. In the year 1893 upon the death of a Mrs. Zlottie Slotnick the present cemetery on Oakwood Road was acquired. A Chevra Kaddisha, a Sacred Society whose duties lay in the preparation of the deceased in accordance with Orthodox ritual, was organized and it brought an adjoining burial lot for its own members. Throughout these three quarters of a century, the Chevra Kaddisha has been unwavering in its faithfulness to duty and to Jewish tradition. For many years it was in the capable hands of its Gabbai, the late Jacob Wells, ably assisted by Jacob Rubin, its longtime secretary. The Chevra Kaddisha has played a leading role in the early sixties. Sadly, its use has been more frequent than had been anticipated. The Congregation, though, has honored its dead by providing a place of beauty for their final rest. The decline of the population of West Virginia in the sixties has been reflected in the decline of the Jewish community and the Synagogue. 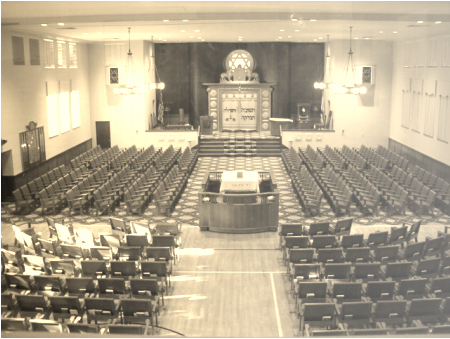 With a high mortality rate, a very low birth-rate, retirement of many to the South, the failure of many of our youth to return home after completion of college studies, Congregation B’nai Jacob suffered a drastic attrition in membership, yet it remains the largest, most active congregation in the State and remains a place of eminence and prestige. Known beyond our borders as a stronghold of traditional Judaism, Congregation B'nai Jacob enters the 21st Century as a vibrant and active center for Judaism here in Charleston, West Virginia.